Thank you, net-a-porter for making Alexander McQueen's pieces available to the masses! The dress that I have decided to feature below, is what I thought would be "purely" a prototype. Only worn by celebutantes and fashionistas, with inside connections and trust fund allowances. This piece is daring, yet beautiful! 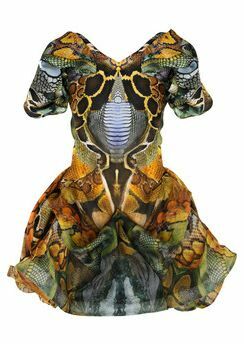 Carefully constructed, with symmetry and the creative eye that only Alexander McQueen possessed. Alexander's work walked a tight rope of the dark side and creating a garment so beautiful, that it makes you seem angelic. GENIUS!!! !